YAY for the weekend, when we can hopefully relax and stretch out a bit! this one is ready to propel forward into a relaxing weekend, Ginnie! Ginnie Hart: My thought exactly, Ayush. This Turtledom is mine..all Mine! Ginnie Hart: I love how they pick their spots, Ray! I hope so! What a great shot of this adorable little creature! Ginnie Hart: I hope so, too, Elizabeth. Thank you. Jolie prise, j'aime sa position. Ginnie Hart: Merci, Martine. I love it when turtles sunbathe. He's having a stretch and wondering what the options are today.. I will certainly stretch and relax. We had builders in and around our house for four weeks and they finished the job yesterday. Today they will remove the rubble and we will be the kings of our castle again. Ginnie Hart: Good for you, Louis, to have a project like that finished. That would be a HIGH-FIVE to us both! Ginnie Hart: Bedankt, Astrid. There's something very "smiley" about seeing the turtles sunbathe like this. Ginnie Hart: Give yourself a high-five once you're done, Alan! Yes, you have deserved a long weekend - what a delight to see such a beautiful turtle - and to capture it so beautifully! Ginnie Hart: Bedankt, Philine. We all need a good weekend before starting out another week! Ginnie Hart: Even for us redheads, Bill, a little bit of sun won't hurt! En pleine élongation, elle est amusante. 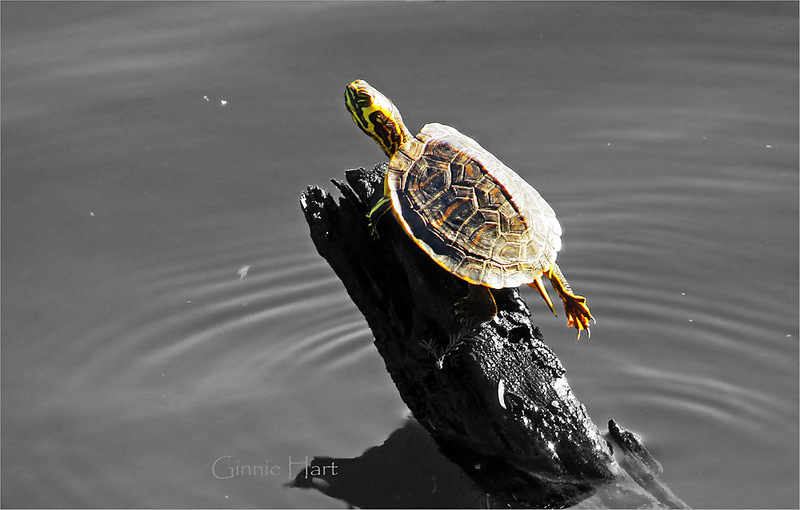 Ginnie Hart: It was fun to see this fella stretching out, Pascale. Merci. Turtle Friday!!! i can get behind that!!! lol look at that sweetie, sunning himself and stretching his legs, is he living the life of Riley? Ginnie Hart: He's giving you a high-five, Elaine (low-five?). This looks funny in a way Ginnie, and a nice photograph. Ginnie Hart: Funny to me, too, Chad, with the high-five foot! What a lovely creature, Ginnie. Was ti quite small? Ginnie Hart: Thank you, Lisl. I think it was about the size of a grapefruit? Not too big. Ginnie Hart: It was fun to see, Anne. Merci. Took so many pictures in Malaysia and Taiwan. Bear with me. Should I say turtle with me? Ginnie Hart: I will bear AND turtle with you, LC. I'm sure you'll have heyday with your new posts! Excellent clarity and light captured here!! I love that you caught it stretching like that. Awesome! Ginnie Hart: Thanks, Mary. I had never seen THAT stretch before, so it was fun. What a cute little character, he/she looks good colour popped against the background. Ginnie Hart: Thank you, Brian. And not much bigger than the size of a grapefruit! A little yoga in the warm sun. A sweet shot. Ginnie Hart: HA! I like that thought, Michael. He's (she's?) in no hurry! Ginnie Hart: Definitely not going anywhere fast, Larry! I like the back lighting on this one. Happy Turtle. Ginnie Hart: Thanks, Bonnie. He was enjoying the Life of Riley in that moment. Oh how cute! What a great yoga pose! Ha! Ginnie Hart: HA! YOGA! I should have thought of that.